Sadly, Miguel could not go to the mission trip. A week before the construction of houses began and Miguel had to stay and help; the construction group has to build three houses in three months. So Wes and Ben were guys that could come. The rest had stay and build. I felt Miguel’s absence but I was very grateful to God for the beautiful Bible promises that gave me strength to move forward. When I returned, I saw that they put all our baggage into the police truck. I asked: “What happened?” They said they had found all the airplanes papers in order and they had also offered to take us to the town of San Joaquin, about 15 minutes away. To my joy, they didn’t check our ID’s and they dropped us off at Adventist Church. Where we found Pastor Michael with six brothers from Caleb Mission. It was a blessing to see God’s hand guiding our arrival at San Joaquin! 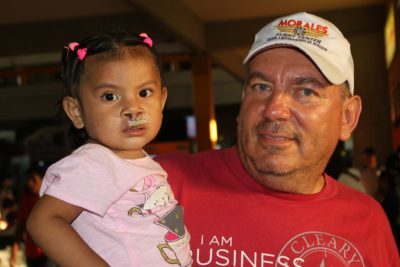 Herman had a medical emergency to Guayaramerin and he suspended the trip that he had planned to pick up Wes and Patty in Trinidad; they arrived at San Joaquin with a van at 3:30 pm, very tired after traveling 18 and half hours. We slept that night in San Joaquin, hosted by one of our brothers in the church! 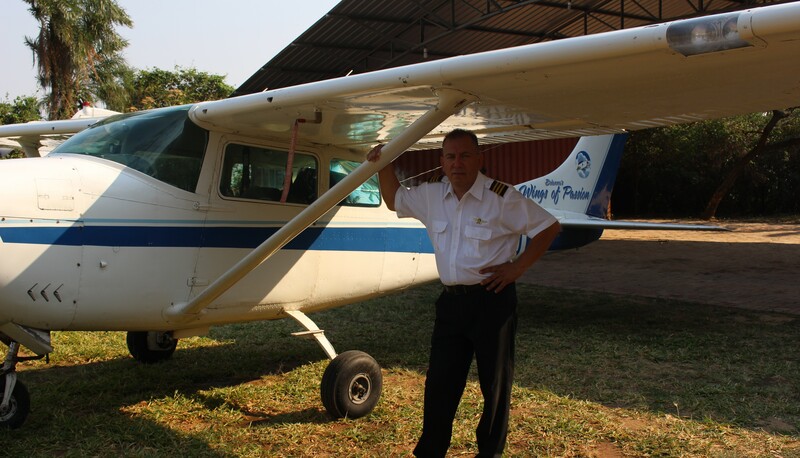 God led our plans so that we could work with Pastor Miguel Bascope (He is with us in the picture with the airplane) and brothers from the church of San Joaquin. They were a great blessing for the our whole group that went! On Thursday morning we left for Puerto Ustarez, a trip of 2 hours on a gravel road, as we were going the the trunk slowed down and the driver pressed the gas but the gas pellet wouldn’t work. So we had to wait for like 1 hour for a mechanic to come and fix the problem. When we arrived Puerto Ustarez, the Pastor introduced us to Brother Alcides and the Mayor, Mrs. Erlina. She knew we were coming and was waiting! We were taken straight to the school, where we served patients and we slept there for two nights on the desks and benches of the classrooms. Br. Alcides and his family, kindly provided hot water in the morning for our oatmeal and in the afternoons to prepare instant soup. Ms. Erlina also provided blankets for everyone. Lara and Ben at the registration table. Ben was controlling blood pressure and Lara is delivering literature and brochures of preventive medicine. The two did an excellent job! We delivered Christian literature such as the book Living with Hope, Happy Life magazine, and Peace in the Storm, which is a reprint of Steps to Christ. We also brought 11 Bibles that literally flew out of our hands. Many were left wanting to have one. We also had prevention brochures for diabetes, high blood pressure, gastritis, tuberculosis, child feeding, personal hygiene and 8 natural remedies. This photo is very significant. This gentleman is waiting his turn for the dentist, while reading his Bible. It gave us joy to see them reading calmly and enjoying what they read. “How do I treat a patient in only one day?” was my constant question. In my area of physical therapy, healing is a process. Only the power of God can bring relief! I prayed with each patient for wisdom, their treatment and also for God to bless their homes. All the patients came with serious faces and with problems and tensions, but after praying with them, they would relax. We began to talk about their problems to be able to pray for something specific, and everyone left the room with a smile. The following day several ladies told me that it was first night they slept in months without pain! How grateful they were: in those places there aren’t any physical therapists and even if an orthopedist tells them to go to a physical therapist, they never go because there is no one to give the treatment. The prayer we did together sure made the difference in them and me! 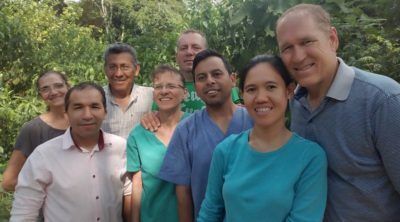 The couple, Wes and Patty, performed extractions, dental cleaning, gave oral hygiene classes and delivered toothbrushes to all the patients. Patty was very excited when one mother told her that her son, after hearing the class on teeth brushing, was brushing his teeth all the time at home. This little boy also brought Patty a plate of food for lunch. This little kind act was very encouraging to us! Wes had a experience that impacted him very much. A patient, a man of about 50 years, had several dental problems but the biggest was the tremendous amount of plaque on the teeth. The plaque had almost covered all his teeth completely. Wes spend much time trying to clean him up. The sitting position was very uncomfortable but the man endured it until the end, and his mouth was totally transformed. Most patients seen for physical therapy had neck problems and severe headaches for months. Women in communities work hard daily, washing clothes by hand and carrying water buckets from the wells to their homes. These efforts give them tremendous back problems. The men also had many problems on their spine because of the motorcycle (it is the only transportation for many) on the bumpy gravel roads, making travel very uncomfortable. I tried to teach them the importance of therapeutic exercises. The picture below shows one of my patients (Diana), washing clothes at home. In Puerto Ustarez we found a special community, made up of 35 families. They have no phone signal and no internet, of course. No one was allowed to raise pigs because the pigs would eat the town’s yucca plantations, and the community is surrounded by many banana plantations. With shortages of fuel for the water pump and the generator broken, we therefore had no water or electricity. The community had wells that were very helpful to them. Thanks to God, Ben had brought a water purifier that we used the whole trip to purify the water. We had 3 cases of typhoid fever on two previous missionary trips before and I didn’t want to repeat the experience. Early Saturday morning we all went to the Guaporé River bordering Brazil, 30 minutes by walking from Puerto Ustarez. There were so many mosquitoes, but we enjoyed the beautiful scenery of the river and canoes. On Saturday, Sabbath school was shared by Brother Alcides, his son Eliezer and his family, and Hermes and his family who arrived from San Joaquin. Many came from the community and that was very satisfying for our brothers. At the end we had lunch together. After lunch on Saturday, we headed to the small community of Campo Alegre with Brother Hermes. it was a truck ride of more or less an hour on dusty roads. Ben, Wes, Patty and three other young ladies went in the back of the truck; afterwords they were covered with red dust. We were told there were nine families, but when we arrived we found a teacher and 6 children and teenagers. After Patty examined them, she only did two extractions. Patty doing extraction in the schoolhouse of Campo Alegre. We had a chance to talk with the teacher, gave her some books and all brochures about prevention. We gave her extra literature to deliver the parents in the community. We were also talking about the great problems of intestinal parasites among students, we left anti-parasitic pills for her and for the families. 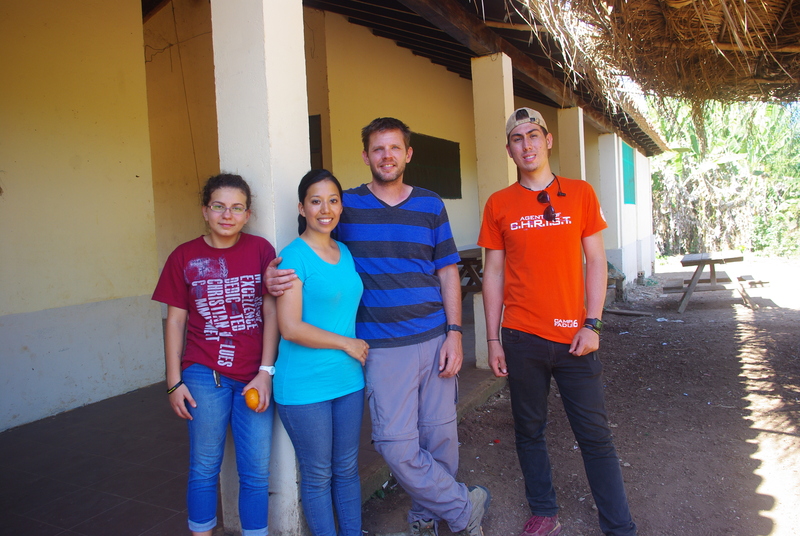 In the evening, we continued our trip and arrived to the community of Chaco Lejos, an hour away. We arrived late at night and we stayed at the school. We cooked our food in the house of the village’s Mayor. Here is Lara preparing to cook spaghetti. 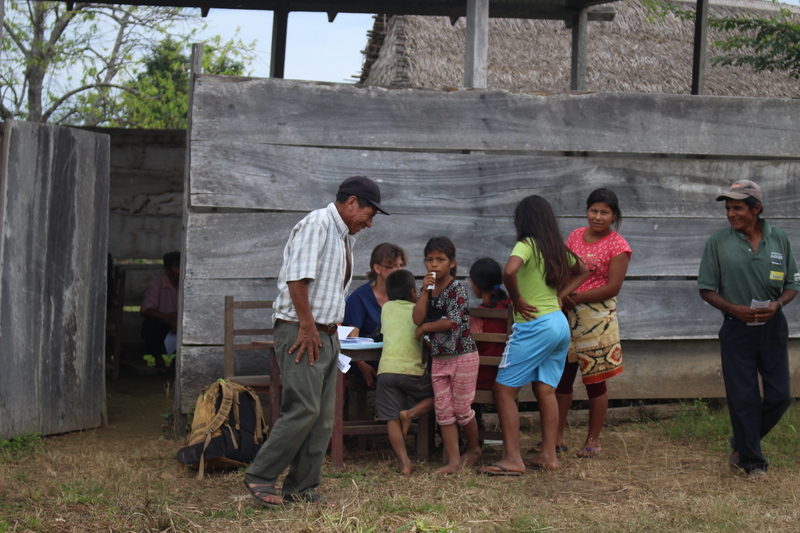 Five minutes away from Chaco Lejos was the Bahia community. Bahia was invited to come and get medical attention. Ben is 17 and lives with his parents in Puerto Rico. He wants to be a pilot and mechanic. The first day we arrived, the Sphygmomanometer did not work. It was given to me six months ago and never had problems. Ben spent a day trying to fix it while we were using a digital one borrowed from the school principal, which didn’t work that great either. He finally fixed it and could continue to use the manual meter. Thanks for all your help Ben! The children were given drawings of the life of Jesus to paint while their parents were being attended, all of them enjoyed it very much! Dr. Patty saw the great need for education in oral hygiene! On Sunday night, Bro. Hermes’ family again came to take us back to San Joaquin. We had promised that we would treat the church members there for free. We took the opportunity to send an invitation on the town radio inviting people to attend the community event. 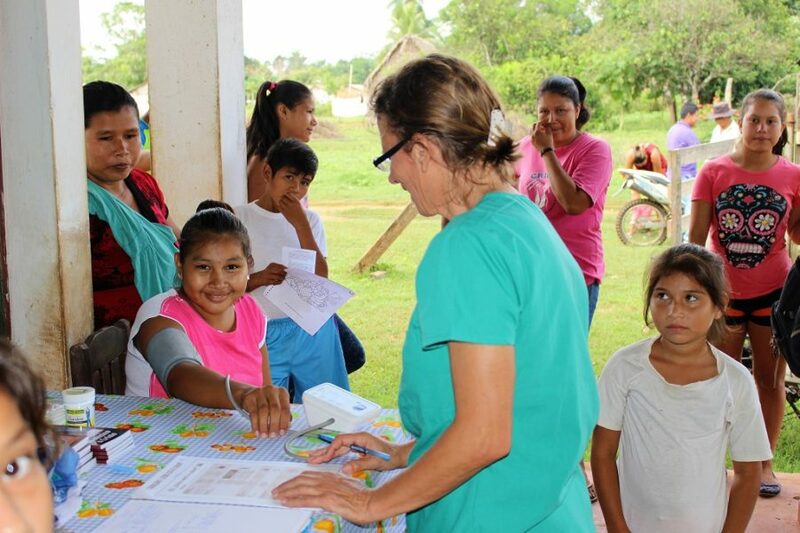 In all the communities (Puerto Ustarez, Campo Alegre, Chaco Far, Bahia) and San Joaquin, 78 patients were treated in Odontology with extractions and cleaning. 30 anesthetics were given and antibiotics were also delivered. Ibuprofen and Paracetamol were given for pain and 94 toothbrushes were given out to the children. Throughout the trip, 41 patients were treated in Physiotherapy, mainly for spinal problems, arthritis, rheumatism, injuries, knee pain and arthritis. Thank God we had medication to deliver. A total of 480 tablets of Ibuprofen were delivered. We also had anti-parasitic medicine for children and adults. We pray for all the people who received medical attention, Bibles and literature, for the Holy Spirit to work in each of them for salvation. We are grateful to God and to each of you who made this trip possible! We want to thank those who supported us financially and those who supported us in prayer before and during the trip! I also want to thank Patty, Wes, Ben and Lara for being a part of this trip. We have much medication left over, and we could say we are ready for the next trip, but we leave it in the hands of God that He may be the One to continue opening the doors!